OAKLAND — As testimony resumed in the Chauncey Bailey murder trial Monday, the journalist’s confessed killer spoke in graphic detail about how he shot Bailey more than three years ago. Devaughndre Broussard said that, as Bailey lay dying on a downtown Oakland street from two gunshot wounds to the body, he stood over the journalist and fired a third time. Where did you aim, Prosecutor Melissa Krum asked. Bey IV and bakery member Antoine Mackey are facing triple murder charges in connection with Bailey’s death on Aug. 2, 2007, and the unrelated shooting deaths of two other men. Broussard has pleaded guilty to killing Bailey and another man, and is expected to receive 25 years in prison in exchange for his testimony against Bey IV and Mackey. 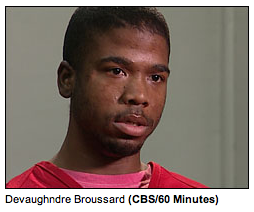 Broussard’s testimony continues all day Monday, when he may face cross examination from defense attorneys. Attorneys for Bey IV and Mackey have said they will aggressively attack the 23-year-old’s credibility. Monday’s testimony was delayed by about an hour because of problems transporting Broussard from North County Jail, where he is being held during proceedings.